San Carlos, Calif., July 3, 2013—For the first time at a major motorsports event, an electric motorcycle beats all of world fastest gas-powered competitors at the Pikes Peak International Hill Climb in Colorado Springs, Co. on June 30th . 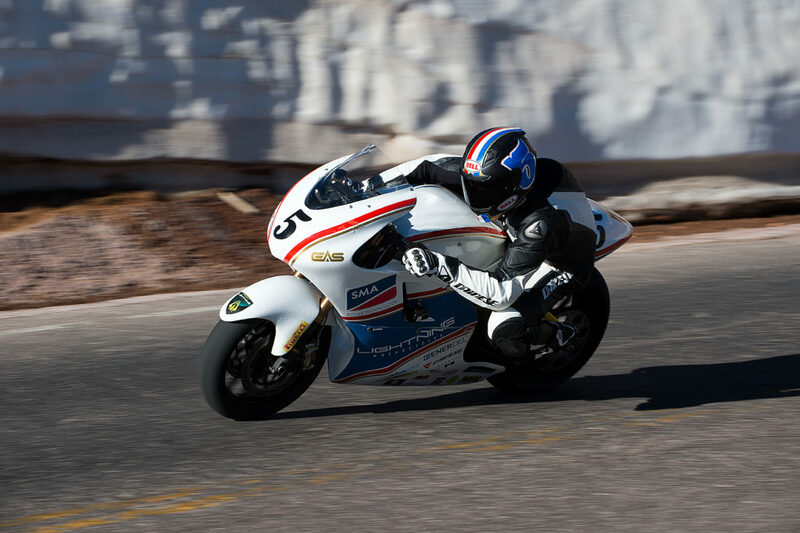 Lightning Motorcycle, the leading pioneer in electric motorcycle , was the fastest of the 82 motorcycle entered and beat all but the 8 fastest cars at PPIHC. Adding to the achievement, the Lightning SuperBike was powered by clean, renewable solar energy. Lightning didn’t just win the electric category, they were faster than the closest world-class gas-powered bike by almost 21 seconds. The majority of the electric bike field posted times in the mid-12-minute range. Lightning Electric Superbike was 2+ minutes faster. The Lightning SuperBike, the world’s fastest electric motorcycle, was powered with solar energy via a SMA (http://www.sma-america.com) inverter and Trina (http://www.trina.com) panels which charge the EnerDel (http://www.enerdel.com) battery pack that provide the vehicle with enough power to win the race.